Learn how to use neem in dogs: treating mange, fleas or ticks with neem dog shampoo and making neem oil spray for your dog. Neem can help dogs with fleas, ticks, intestinal parasites and mange mites. It promotes a strong immune system, healthy skin, a shiny, problem free coat, strong healthy teeth, all the signs of a radiantly healthy dog. People usually only discover neem when struggling with a persistent condition that no nasty prescription drug could clear up. And then: a natural product resolves the problem seemingly over night. It is not surprising that we forever read about the "miraculous" abilities of neem and neem oil. It's a shame that it takes a severe problem for people to discover neem oil for their dogs. It's also a shame that by then the dogs have usually suffered for weeks or months and have been subjected to a range of heavy duty medications, which in themselves have taken a heavy toll on the immune system and the general health of the dog. With the regular use of a neem dog shampoo (product link) and occasional supplementation of dog food with neem leaf it is often possible to prevent problems in the first place. This is simple and obvious: give your dog a regular wash with neem shampoo and occasionally supplement its food with neem leaf. One of the best things you can do for your dog is to buy or make a good neem oil dog shampoo. Yes, I said make. 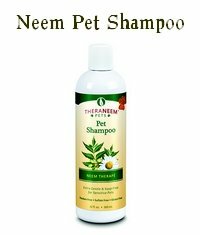 Any dog shampoo can be turned into neem dog shampoo by adding some pure neem seed oil into it. The neem leaf is a powerful herbal supplement that strengthens the immune system in general, supports liver function, purifies the blood and may eliminate intestinal parasites. Considering that most dogs eat commercial dog food, such a herbal supplement is a good idea. No matter if it's a fungus (ringworm), mites (mange), or biting insects, neem oil helps dogs. How exactly you use neem on your dog depends on the severity of the problem. 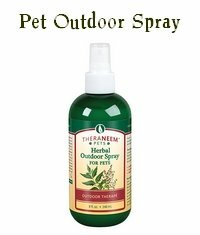 Using neem spray: dogs can be sprayed with neem spray (product link), just as we spray ourselves with insect repellent. You can do this to prevent problems or re-infection. You can also use a spray to treat your dog repeatedly. This may be necessary when dealing with a persistent problem. It's certainly easier than bathing your pooch three times a day. Using neem dog shampoo: bathing with a neem dog shampoo is of course also an excellent way to discourage fleas and ticks, and to clean up mange or ringworm. Make sure you leave the shampoo in for several minutes (as long as your dog will tolerate it) before rinsing. Do this two or three times a week. That usually does the job. If making your own neem dog shampoo (by adding neem oil to normal dog shampoo), source some oatmeal shampoo. It's the best shampoo to soothe already irritated skin and relieve pain and itching a bit. Otherwise use the mildest shampoo you can find. Using pure neem oil: if you have a severe case of anything you may want to try pure neem oil. Don't use it undiluted, though, especially if the dog has cracked, open skin, oozing sores etc. Neem oil is very strong stuff! You would add to the stress and discomfort, and that makes things worth. Rather dilute the neem oil 1:10 in a light carrier oil (e.g. grape seed oil or almond oil). Then massage the oil mixture into the skin. You can apply it several times a day on problem spots. For hot spots like moist eczema, or to treat demodectic mange, you can increase the concentration to a 1:1 ratio. Some people do use 100% pure neem oil in those cases. Don't leave the pure oil on the skin for more than 48 hours, or you dog may develop an irritation. Also monitor the skin, and if there is any reaction, wash the oil of immediately. Using neem leaf: the preferred Ayurvedic people treatment for scabies (the human equivalent for mange) is a paste made from neem leaves and turmeric. It's more effort to make than the oil, but is certainly a good thing to use on dogs with mange. An easier way to use neem leaves on dogs is to make a strong neem leaf tea or extract, and to dab or spray that onto the skin. Internal use of neem leaf helps with intestinal parasites, generally helps the intestine, stimulates liver function and strengthens the immune system. 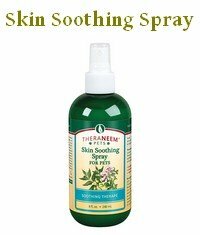 In short, it will help your dog to deal with the external skin problem by fighting it from the inside. Neem affects many internal parasites, but it is not effective against tapeworm. Neem is also not equally effective against all ticks that may affect dogs. Particularly the brown dog tick appears to be very resilient. While neem will help it will not prevent all bites. This was a general introduction to using neem for dogs. Below are links to more detailed information and related articles and questions. Is Neem Oil Safe For Cats? What if my dog ingests neem?